What does Ballmer leaving Microsoft's board mean? Under Steve Ballmer's reign, Microsoft expanded from a company that made and sold software, to an expansive enterprise that grew to almost rule the world, putting software on over one billion PCs and powering all kinds of businesses with their servers and services. Sure, there were mishaps and failings – how could he be forgiven for missing the boat on smartphones entirely? – but the fiscal results remain: Microsoft swelled to a company with over 100,000 employees on the payroll, a market capitalisation of almost $400 billion (around £240 billion, AU$430 billion) and profits in the billions. However, Ballmer has recently stepped down from the Microsoft board, and in his resignation letter to Satya Nadella, he says that he "bleed[s] Microsoft," a statement that becomes rather self-evident when watching an impassioned speech from him on stage. While Ballmer may not have the futuristic ideas of Elon Musk, the cool efficiency of Tim Cook, or the mathematical genius of Larry Page or Sergei Brin, he did have a real, legitimate and honest passion for the company that he oversaw for almost 15 years. Rarely do you see a man so in love with a company that, at his final all-hands meeting, he would weep openly whilst delivering a typical whirlwind performance on stage. If nothing else, Steve Ballmer will go down as charismatic. The era that Ballmer has now ushered in is full of promise, as he notes in his letter. "We have the profitability to invest in long-term opportunities and still deliver superior shorter term performance. You're off to a bold and exciting start," he wrote to Nadella. Of course, the "long-term opportunities" could refer indirectly to a number of things, from Microsoft's alleged wearables push – the fruits of which we are yet to see – to Windows Phone. All of which make Microsoft an exciting enterprise to cover going forward into 2015 and beyond. No more is it a two horse race between Apple and Google for the hearts of consumers as it has previously been, but an effort by a third party – Microsoft under Nadella's reign – to capture them, too. Nadella will, of course, slip up. The way the leadership at Microsoft handled the recent round of layoffs that ushered Nokia into the company could've been improved beyond a rather stiffly worded memo with very little that was at all personal or human-like about it. In other areas, Nadella appears to be executing a vision, as Ballmer recognises in his letter. "Our board must also support and encourage that fearlessness for shareholders to get the best performance from Microsoft. You must drive that," says Ballmer. Already we see small signs of this, with the Office suite coming to the iPad in an attempt to broaden its range and application in today's world. Steve Ballmer's time at Microsoft was a period of great growth, and a strengthening of the company's core properties along with missed opportunities. 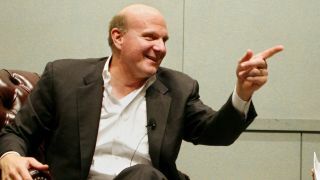 Ballmer was a charismatic, pragmatic businessman and should be remembered fondly by all those who worked under him or covered Microsoft throughout his tenure. Ballmer being separate from Microsoft means that the last thing on the list – his slip ups – can now be forgotten, and improvements made by Nadella can drive the company forward into new and exciting spheres.